Do You Want to Be Average(d)? Average is bad! At many places children are taught to try their best, at school, at sports and later in life also at their jobs and in scientific research. People want to keep improving themselves. Average is never considered good. If you don’t stand out people do not notice you and how then can you get on in life? In science this is the same. Often only the best results get presented and published. Average results are frowned upon. Figure 1. Schematic of Kernel Average Misorientation (KAM) determination. But are there also cases where being average can actually be good? 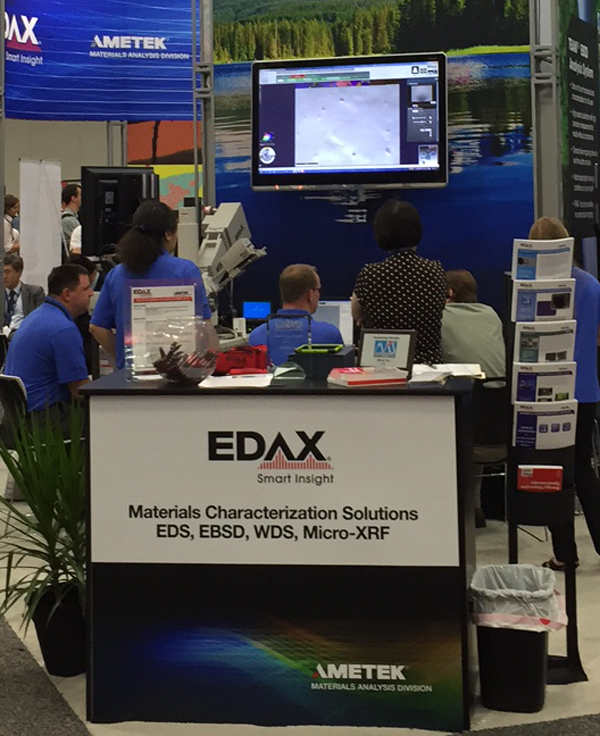 In the world of EBSD analysis that is certainly the case. For example in EBSD deformation analysis people have been using Kernal Average Misorientation (KAM) maps for many years to illustrate and investigate subgrain structures. This takes the orientation of a pixel and calculates the average of the misorientation with its 6 neighbours (fig. 1). 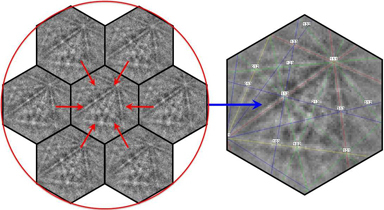 This tool is highly effective in visualising subgrain structures and lattice bending and takes full advantage of the unique hexagonal scanning grid that is used in the EDAX EBSD software (fig. 2). Without averaging – no results! Figure 2. KAM map illustrating the subgrain structure in a partially recrystallized steel. Figure 3. NPAR reprocessing principle. With this in mind another type of averaging has recently been introduced in the EDAX TEAM™ software: NPAR. This stands for Neighbour Pattern Averaging and Reindexing. Similar to KAM, NPAR takes an EBSD point and then considers the 6 points in the hexagon around it. But in this case the orientation is not used. Now the original 7 patterns are put together and averaged onto the single pattern in the middle which gets indexed (fig. 3). The averaging is then repeated for every pixel in the map. This procedure dramatically reduces any pixel intensity noise in the patterns and allows even very weak patterns to be properly identified and indexed. An obvious drawback of this would be that you lose a lot of detail in your EBSD maps as you are still averaging pixels, right? Wrong! Well OK, a little bit right. In some cases you indeed lose information, especially if you are investigating narrow lamellae with the pixels on either side having the same orientation and the lamella in question only has very few pixels across. The averaging will then suppress the information coming from the lamella and it will indeed disappear from the map (fig. 4). But in general things are not as bad as might seem at first glance. Figure 4. IPF map of Ni alloy a) before and b) after NPAR reprocessing. Some details, like the twin lamella in the yellow box , have disappeared due to NPAR reprocessing. So, where else would you lose detail? You would expect it at grain boundaries and in heavily deformed areas. First let’s take a close look at a boundary. When you average a point next to a grain boundary, you will get patterns from different orientations being averaged together. The good news is that initially only 2 or 3 points will show diffraction bands from the second grain while 4 or 5 contributing points still contain the bands from the original host grain (fig. 5). This will cause the bands from the host grain to be brighter in the averaged pattern. And here a little known property of the triplet voting indexing algorithm comes into play, the intensity ranking of the triplets. The ranking will ensure that any triangles constructed from these brighter bands will be given higher importance in the orientation determination and bias the orientation towards that of the brighter pattern. Therefore typically the orientation of the majority of the contributing patterns will prevail. In effect there will be only minimal shifting of the grain boundary position in the resulting map because of this, but a clear improvement in indexing success may result (fig. 6). Figure 5. Effect of including patterns from adjacent grains on NPAR averaging a) 2 pixels from a second grain are included in the average – no effect on the indexing of the central pixel, b) 4 pixels from the second grain are included in the average – now the pixel orientation corresponds to the majority of patterns. Figure 6. IPF map of fine-grained meteorite sample a) before and b) after NPAR reprocessing. The grain boundary positions have not changed, but in the reprocessed map the indexing success is higher and smaller grains are successfully recognized. An even more visible effect will occur in the Image Quality maps. IQ values are related to the intensity of the bands with respect to the average pattern brightness. Any pixel noise in the patterns will effectively decrease the contrast and therefore reduce the sharpness in the IQ maps. NPAR dramatically reduces this pattern noise and improves the grain definition in the IQ maps (fig. 7). Figure 7. IQ map of an EBSD analysis on a staple a) original map and b) after NPAR reprocessing. Note the improved grain boundary definition and grain structure, especially in the fine grained areas. The nature of the NPAR pattern processing also acts as a smoothing filter for intensity gradients in your patterns that are caused by topographic variations in your sample. An application there would be to reduce the pattern intensity gradients introduced by curtaining on FIB or ion-milled specimens. So far so good! Now let’s take a look at how NPAR would affect the measurement of deformation features such as lattice bending. Here the observed contrast improvement in the patterns has another neat advantage. The band detection in the patterns becomes more consistent which effectively reduces the error in orientation determination. This actually improves the orientation precision for routine mapping to 0.1 – 0.2 degrees (fig. 8). Figure 8. Orientation profiles along the traces indicated in Figure 7 a) original orientation profile, b) after NPAR reprocessing. This improvement is clearly visible in figure 9 which shows a local orientation spread (LOS) map of the deformation around two nano-indents (the black areas) collected with 50 nm steps on a W SEM. Figure 9. Local Orientation Spread (LOS) maps of two nano-indents in a Ni alloy, a) original, b) after NPAR reprocessing. Figure 10. Orientation profiles along the traces indicated in Figure 9 – a) original orientation profile, b) after NPAR processing. The NPAR reprocessing does not blur the structure as you might suspect, instead it sharpens it. This can be explained by considering the volume in the sample from which the EBSD patterns originate. The lateral resolution of EBSD is typically recognised by the smallest grains with a distinct orientation that may be identified, which is in the order of 25-50 nm depending on the material. However this is not the same as the actual information volume. The latter can be estimated from the distance to a boundary when a contribution from the second grain becomes visible in the pattern. This is in the order of 150 nm in many materials. Normally we don’t care too much about this distance as the contribution of the second pattern will not yet switch the orientation to that of the second grain, but it will deteriorate the orientation precision and thereby the determination of the misorientation between the grains. 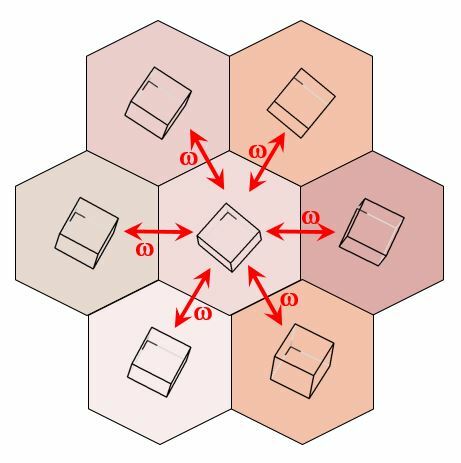 Now, if diffraction information from a second grain already becomes visible over a distance of 150 nm, it is to be expected that this information volume is also valid in subgrain- or dislocation networks inside a grain. But here the effect is not as obvious as at a high-angle grain boundary. EBSD patterns generated in deformed areas already look unsharp where the degree of fuzziness is determined by the density of lattice defects in the interaction volume. So inherently, if you collect maps with stepsizes below 150 nm in deformed materials, you already lose orientation detail without realising it as the unsharp patterns contain information originating from a 150-200 nm source volume. And now back to NPAR averaging; considering the information limit of 150 nm, you may want to consider scanning a material with stepsizes of 50-100 nm steps, record all the patterns and then apply NPAR reprocessing. This will average the patterns within the effective information volume and as described before it will improve the orientation precision. This allows a good representation of the deformation microstructure. If you are scanning a material with larger stepsizes, then applying NPAR will artificially increase the information volume and smooth out any orientation gradients that may be present. Whether or not this smoothing is acceptable for your analysis depends on the feature size and the properties that you need to determine from your scan. On recrystallized materials with limited deformation structures the stepsize is not so important and applying NPAR may improve the indexing rates without harming the structure determination. So on average, averaging may actually help a lot in improving your results! One of the things I learned during the 2015 Microscopy and Microanalysis meeting was just how efficient plasma cleaners really are and this is a short story about how it saved the day for us. We had shipped our older Hitachi S3400N microscope from Mahwah to Portland for the show and had tested everything before it went on the truck. The meeting opened Monday August 3 at noon so Sunday was set aside for getting everything set up and calibrated. While our service group had done most of the work, I had a bit of data I wanted to collect for the days to follow. So I sat down at the microscope, turned on the beam, and stared at the current meter showing next to nothing. I checked the usual microscope settings and fidgeted with the apertures but still couldn’t get a decent current down through the column. Since we were a little short on time and the Hitachi booth was close by, we went over and looked sufficiently desperate for the Hitachi service guys to take pity on us and come to help. I noticed the Hitachi guys going through the same steps I had done and end up with the same problem, so at least it wasn’t just down to my short comings regarding microscope service. As the last step they pulled out the aperture strip and the black gunk covering all three apertures gave us a pretty good indication of the problem: the beam was being severely attenuated simply because the apertures were clogged up with carbon contamination. Of course the Hitachi guys’ immediate question was “Did you bring a new aperture strip?” and my answer was a meek “No…”. But then I remembered that I did bring a plasma cleaner. I didn’t really believe that it would be able to do much with the level of contamination that we had on the apertures but it was still worth a shot. So I put the aperture strip in the cleaner chamber and ran it at a pressure of 2*10-2 mbar with a power of 50 W.
I have to say that I was extremely surprised when the aperture strip looked as good as new after only 10 minutes of plasma exposure. Both the EDAX and Hitachi service guys were equally impressed and after mounting the strip back in the column we were up and running again. So 10 minutes of plasma cleaning saved us from having to either try to have an aperture strip shipped in overnight or run the microscope with no aperture and ensuing risk of sample damage and reduced imaging capability. Unfortunately I didn’t take any pictures before and after cleaning, as I honestly was not expecting it to work, but the picture below shows us busy running demos on the Hitachi during the show. At this point you might wonder why I had brought a plasma cleaner in the first place. Well, one of the things that we were highlighting with the new Octane Elite detector we launched at the show was the silicon nitride window and its durability. 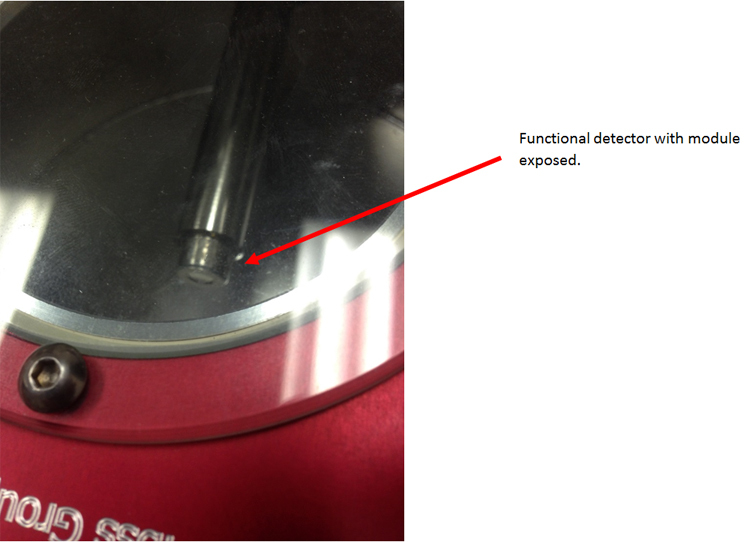 I had run a test on my office desk with a live detector mounted directly on an asher chamber (shown in Figure 1) that I borrowed from Vince Carlino of ibss Group, Inc. When the asher chamber is running, it looks like something out of a science fiction movie so we wanted to do something similar at the M&M meeting as a visual prop. Figure 1: Silicon nitride window detector mounted on ibss asher chamber. Since a full detector takes up space we simply put a single detector module directly in the asher chamber and started the cleaning process on Monday when the exhibition began. I took pictures of the controller for the system and the module at the start and end of each day as can be seen in the picture sequence below. Figure 2: The controller and module at the start and end of each day. After almost 76 hours of continuous plasma exposure, the silicon nitride window shows no signs of degradation and knowing what plasma cleaning did to the aperture strip, I am pretty certain that was absolutely no carbon contamination on the window. Of course this is more of a show-and-tell kind of experiment and the testing I did before this involved detailed monitoring of the module performance and temperature to detect any pin-holes that would not be visible by eye. That report will be available shortly. The next step will be to try the same with a polymer window but I am still thinking about exactly how to design the experiment. Of course I could just clean it for an extended period of time and see if the window is still intact but it would be nice to have a metric of how fast the damage occurs (or not). One idea would be to use a bare window and correlate the ratio of the carbon and aluminum signal of the window to the silicon peak from the support grid in order to monitor any changes in thickness, but if anyone has other suggestions, I would be happy to hear them. Even though the tabletop plasma cleaner has been around for a number of years, its complete usefulness is sometimes is overlooked because it is a small piece of auxillary equipment. Sometimes, however, the smallest of equipment can provide the largest benefit!